Thanks to a baby photo from Jane Cogan, the newest killer whale in J pod has been identified as a girl, according to Ken Balcomb of the Center for Whale Research. 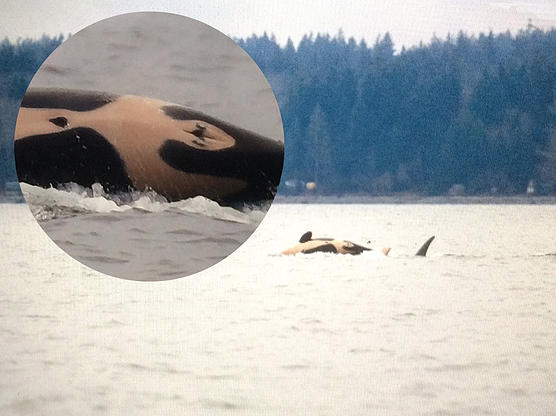 The baby killer whale, J-50, reveals that she is a girl as she swims with her family in British Columbia. We still don’t know whether the mother is 42-year-old J-16, known as Slick, or Slick’s 16-year-old daughter J-36, known as Alki. At moment, the family group, which consists of J-16, her three offspring plus the new calf, are sticking close together. “It may take a little time for us to sort it out,” Ken told me, but the mother should become apparent within a few weeks, if not sooner, because the calf must be getting milk from the mom. From all indications, the little one is doing fine. Initially, the calf was thought to be the offspring of J-16, because J-36 was some distance away. But now it seems just as likely that J-16 was babysitting while J-36 got some rest, Ken told me. Yesterday, Jane and Tom Cogan of San Juan Island took an overnight trip up north into British Columbia, where J pod has been swimming near Texada Island since the beginning of the new year. Jane sent back a good photograph of the baby’s underneath side. According to Ken, it is not unusual for mothers to roll their babies near the surface of the water. Female killer whales have a more rounded pattern in the genital area, while males have a more elongated pattern of coloration. A good photo is all it takes to tell a boy from a girl. For comparison, see Questions & Answers at Center for Whale Research website. I talked to Tom briefly this afternoon. He told me that J-50 was acting playful at times, like young whales will do, with some tail slapping and porpoising. “I would say it looked healthy,” he said. “It was following J-16 a lot of the time, but all of the family was in the area, and they would group up at times. “We’ll show Ken our pictures and debrief him when we get back,” he added. As of this afternoon, J pod, including the J-16 clan, was near Nanaimo, B.C., and headed south toward the Washington border, according to Tom Cogan, who was in the vicinity.